There is no denying Apple has had an incredible run. After a number of strategic and execution mistakes, the company almost went bankrupt in 1996. It was greatly helped in 1997 when Steve Jobs returned as CEO and announced that Microsoft invested $150 million and made a five-year commitment to develop Office for the Mac. Steve Jobs slashed Apple’s 15 product lines to just 4 categories: desktop and notebook Macs for consumers and professionals. Jobs halted the Macintosh licensing program. In 1998, he hired Tim Cook as COO. Cook had worked at Compaq and IBM and was tasked to “clean up the atrocious state of Apple’s manufacturing, distribution and supply apparatus”. He hired Taiwanese contract assemblers to manufacture Mac products. He revamped Apple’s distribution system from smaller outlets to national chains and also launched a website to offer direct sales for the first time. Apple’s inventory fell from months to a few days! In 1998, the company posted a $309 million profit, reversing the 1997 $1 billion loss allowing Steve Jobs to increase R&D spending. The transition to Intel CPUs allowed Apple to build chips that were faster and less power hungry, essential now that notebooks account for the vast majority of Mac sales. This also allowed Macs to run Windows applications if the user so chose, thus offsetting one of the longstanding disadvantage to choosing a Mac – the relative lack of Macintosh software. The move into direct retail distribution also proved revolutionary. The first Apple retail store opened in McLean, Virginia in 2001. The Apple retail experience gave many consumers their first exposure to the Macintosh product line. By 2009, Apple estimated that half of all retail Mac sales were to “new to Mac” customers. The retail division with more than 280 stores in 10 countries grew to account 16% of Apple’s total revenue. The company also entered into a partnership with Best Buy, the world’s largest electronics retailer. While it was essential for Apple to fix its Mac business, it’s the new product lines that really put Apple on its explosive growth path. Apple introduced the iPod in 2001. With its sleek design, simple user interface and large storage, it put other MP3 players to shame. Apple had the foresight of allowing the iPod to work with both Macs and Windows machines. The distance only grew wider when Apple introduced the iTunes Music Store starting in April 2003 which was the first legal site that allowed music downloads on a pay-per-song basis. With its large catalogue and ease of use, it allowed Apple to capture the MP3 market. By 2010, Apple was estimated to have around 70% of the US MP3 player market. In 2007, Apple introduced the iPhone. While the product was revolutionary in many ways, it was not a huge success. Apple actually only sold 6 million of the first iPhone because it was sold for $499 without a subsidy and AT&T gave a revenue share back to Apple. In 2008, when Apple released the second iPhone which ran on the faster 3G network, it smartly revamped its pricing model. AT&T provided a subsidy in exchange for dropping the revenue share agreement. Consumers could now buy an iPhone for $199. With the 3G model, iPhone revenues exploded to $13 billion by the end of 2009. When the 3GS went on sale in June 2009, the subsidized 8Gb iPhone price dropped to $99. The recent very successful launch of the iPad further extends Apple beyond its Mac roots and diversifies its revenue base. Apple is currently on top of the world. It has the highest market cap of any tech company, recently surpassing Microsoft’s and dwarfing Google’s. It also seems perfectly positioned for the future given its strength in smartphones. Apple is now essentially a mobile company. As of the last quarter, Mac sales accounted for $4.4 billion of revenues (with 31% growth year to year), iPod sales for $1.5 billion (4% growth), iPhone sales for $5.3 billion (74% growth) and iPad sales $2.1 billion out of a total of $15.7 billion. Apple is arguably in the perfect business. US smartphone penetration just crossed the 20% mark and global smartphone penetration is around 10%. Undoubtedly at some point in the next 5 years the majority of phones will be smartphones and eventually almost all phones will be. Market growth alone should buoy Apple. Expanding the number of carriers that carry the iPhone in countries it has released the iPhone. Releasing the iPhone in more countries. However, Apple and Steve Jobs seem to be repeating a number of strategic mistakes that seem destined to relegate it to a niche player. In 1984, when Apple introduced the Mac in 1984, it was revolutionary. It was elegant, simple to use, had the first mass market mouse and graphical interface and became a huge success. Apple seemed destined for greatness. However, Steve Jobs’ vertical integration driven by his desire to only have beautiful machines and software limited both innovation and the availability of software. On the DOS, then Windows side, the constant competition between PC makers, processor makers, and software developers, while less elegant and functional at the beginning, given enough time led to a plethora of offerings and innovation that not only copied many of the Mac’s best features but extended them. The competition also drove prices much below Mac prices. The combination of faster PCs with more software at lower prices eventually completely marginalized the Macintosh. Steve Jobs seems to be repeating the same mistake all over again. The elegant integration between the iPhone, iTunes and the App Store is definitely a current source of comparative advantage. It is easier to offer a better user experience at the beginning when you limit the form factor and completely control the hardware and software. The iPhone 4 is clearly the best smartphone on the market. The apps in the Apple App Store are clearly the best apps on the market. However, Apple’s insistence on having a single form factor, on being a premium player at a premium price point (to carriers at least), and its arbitrary decisions with regards to what apps make it in the App Store will eventually make Apple a niche player. Even if Apple keeps innovating and has the best phone on the market, it won’t matter. Android, with its relative openness, seems to be playing the role Windows played for the Mac. We are already seeing a plethora of Android phones which cover all segments of the market – from the very low end to the very high end. There are phones with keyboards or without, Amoled screens, huge screens, small screens… There is already seems to be an Android phone for every taste and the choice is only going to get larger. In only one year Android’s smartphone market share catapulted from 1.8% to 17.2% overtaking Apple’s iPhone which grew from 13% to 14.2% of the market. 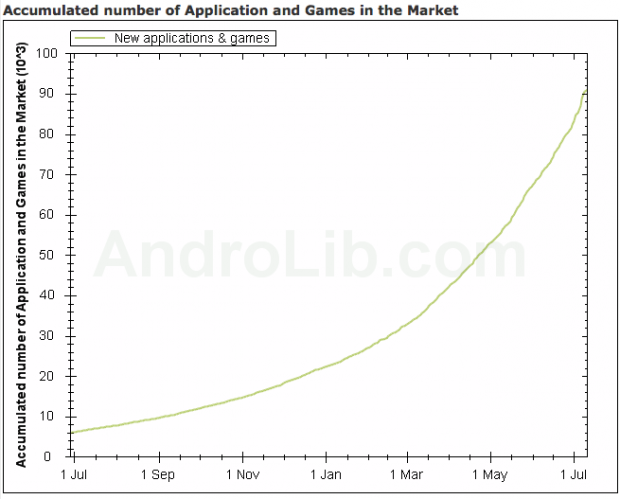 Moreover Android is now activating more phones in the all-important US market, despite the iPhone 4’s recent launch. It’s unclear to what extent the number apps offered is relevant. Regardless of the answer, it won’t play in Apple’s favor. It could be that the top 30 apps are all that matter (e.g. ; Maps, Facebook, Email and a few games), in which case the current better quality of Apple apps will eventually be matched by the apps on Android. Alternatively, and arguably worse for Apple, if it’s the diversity of apps that matters, the relative openness of Android will mean that there will eventually be many more apps for Android phones than for Apple given its desire to only have “pretty” and “elegant” apps. This will only get worse as Android’s market share will increasingly exceed Apple’s and many developers will first build for Android and the guarantee of appearing in the Android App Store versus taking a risk with Apple’s fickle App Store approval process. 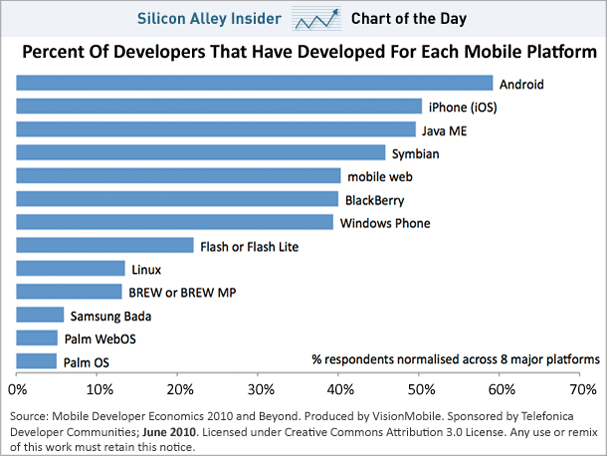 More developers are already developing for Android than the iPhone and the number of Android apps is rapidly approaching the number of iPhone apps. Furthermore, with the iPhone Apple has taken vertical integration one step further. It acquired PA Semi for $278 million in April 2008 and Intrinsity in 2010 and now designs its own chips. Both the iPad and the iPhone 4 run on the A4 chip it designed. This means that in addition to competing with Google, all the handset manufacturers in the world and many app makers, it now has to compete with the likes of ARM! It’s extremely hard to be world class in so many product categories and arguably Apple has just made its job of having the best smartphone on the market that much harder. In a few years it might end up with underpowered phones relative to the Android phones very much like the Macs used to be underpowered (and overly power hungry) before Apple made the switch to Intel! None of this will matter in the short run. Globally increasing smart phone sales and extending sales to new carriers will buoy growth for some time to come, especially since Apple still has a better phone and better apps. 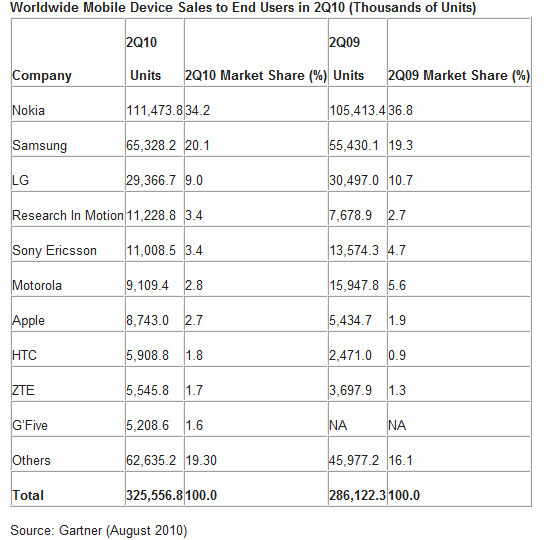 However, this growth will bely the fact that Apple is losing market share rapidly to Android. Fast forward 5 to 10 years and it’s not hard to imagine seeing Apple with a small (but probably very profitable) share of the smartphone market. It will be a niche player in the market it revolutionized and could have dominated. History seems bound to repeat itself!